Still in need of a holiday gift? Here are three for food lovers, in the form of electronic gift certificates (e-gift cards), quickly emailed from the companies’ websites. We love to give Chocomize gift certificates. 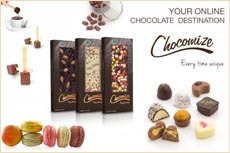 They enable the recipient to customize their own chocolate bars with a choice of scores of different add-ons. There are also boxes of bonbons, macarons and hot-chocolate-on-a-spoon, that that makes hot chocolate when swirled into milk. Gift certificates are available from $10 to $500 at Chocomize.com. 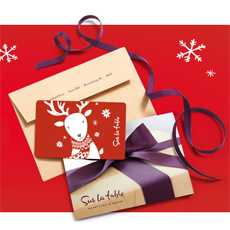 At Sur La Table, e-gift cards are available from $10 to $500. Head to SurLaTable.com. E-cards are emailed five times daily. If you want to send a conventional card, it takes 5-7 days. You can do the same at Williams-Sonoma. At both stores, e-gift cards can be used for purchases online, in-store or by phone. Plan ahead and you can add your own custom photo to a conventional gift card at Williams-Sonoma. Go online and send e-gift cards (typically, a photo of a gift card gets e-mailed). Top photo: SurLaTable. Bottom photo: Chocomize. For someone who loves to cook, AllMyChefs.com is a new gastronomy site with recipes from more than 50 renowned French chefs. Alain Ducasse, Pierre Hermé, Paul Bocuse, Daniel Boulud and Eric Ripert are just some of the top toques represented. The chefs share their secret recipes, tips and personal favorites. Subscriptions are $4.95/month; you can give a gift subscription, 1 year $59.90 or 6 months for $34.90. There’s also a 15-day free trial if you want to try it yourself. Head to AllMyChefs.com; the gift subscription tab is at the top right.